The Picturehouse and FACT have paid tribute to the veteran film maker Agnes Varda for a third time in the past two months. As well as her film work being part of the Liverpool Biennial and also the screening of a series of her films, they have now shown a documentary created by her and French installation artist and photographer JR, 65 years her junior, and who wears shades throughout the film. 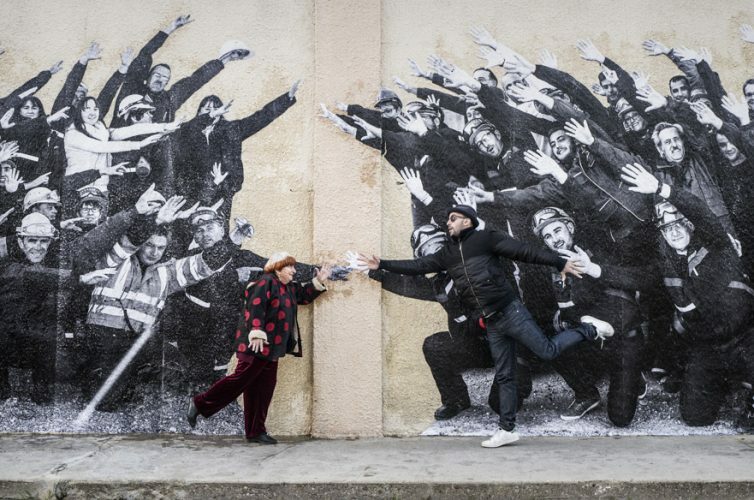 Faces Places is a journey by them through rural France, taking photographs of people they meet for the first time, which are printed in giant size form, from the side of the van they travel in, which has a giant box camera. They are then pasted on various buildings, including houses, farm barns and a water tank. Bizarrely images of Varda’s eyes, hands and feet are attached to a cargo train. in the only low point of the film they also pasted photos of the wives of three harbour workers on the side of shipping containers. I could not see any point in this instance of photography. The notable people they meet include factory workers, farmers and an engaging oddball character called Pony, who makes artwork from bottle caps people have discarded. Another individual worth mentioning is Jeanine, who is the last person living in a row of former miner’s homes that are due to be demolished. It will be a pity to see the portrait of her on the entire front of the house razed to the ground. Varda, at the age of ninety, is very aware about mortality but confesses she is not afraid to die. “That will be that,” she said.